That's a wrap! The Nun, the second spin-off movie series from The Conjuring universe, has officially finished filming and is heading into post-production. The news was confirmed on social media by director Corin Hardy (The Hallow), who is getting ready to start cutting the movie together so that we can see it in just over a year from now on July 13, 2018. Corin Hardy took to his Twitter account to declare that filming on The Nun is officially complete. He posted a couple of photos to honor the occasion, one of which featured a clap that was being used during shooting on the final scene. He also posted a wrap photo that featured the entire cast and crew, minus a couple of pretty important figures who couldn't be there. Here's what Corin Hardy had to say about it. "Day 38. Aaaannndd.......Holy Habits, that's a wrap!! #TheNunMovie #NunArmageddon #missingBonnieandJonas"
This is going to be the latest in a number of spin-offs that New Line Cinema is cashing in on, thanks to the success of The Conjuring and The Conjuring 2. The first spin-off, Annabelle, did well financially, but unlike both of The Conjuring movies, it wasn't received well critically. Though, it sounds like that may have been a slight misstep. Early buzz for the sequel, Annabelle: Creation, which is directed by David. F Sandberg (Lights Out) is outstanding, so we have every reason to believe that The Nun is going to continue that trend of well-made horror movies within this universe. Plot details have been somewhat scarce for The Nun so far, but it is going to center on Valek the nun from The Conjuring 2, who was actually a last-minute addition to that movie. Bonnie Aarons, who was missing from Corin Hardy's wrap photo, is reprising her role as Valek for the movie. Joining her is Demián Bichir as Father Burke, Charlotte Hope as Sister Victoria and Taissa Farmiga as Sister Irene. As it turns out, Taissa Farmiga is the real-life younger sister of Vera Farmiga, who plays Lorraine Warren in The Conjuring. So maybe we'll get some sort of connection here? To date, The Conjuring movies, including Annabelle, have made $895 million worldwide. Considering that the budgets of these movies are much lower than your average studio tentpole, especially in the case of Annabelle which cost under $7 million to make, the studio is going to expand this universe as much as possible. They recently started work on another spin-off centered on The Crooked Man from The Conjuring 2, as well as getting work started on The Conjuring 3. The Nun's success or failure may help determine the fates of these future Conjuring movies and, if it's good, expect more in the future. 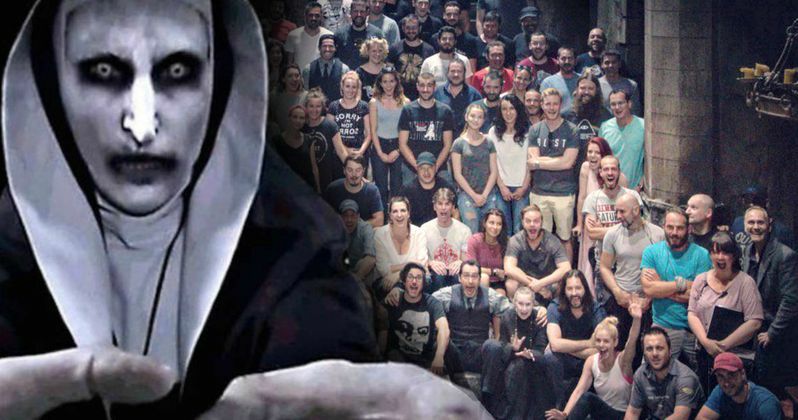 You can check out the wrap photos from the set of The Nun for yourself below. We will be sure to keep you up to date as more information on the movie is made available.